The human energy field called the Chakra System is an energetic processing structure with distinct purpose in our development. In classifying, coordinating and arranging all our life experiences, it offers up a template of the person we are today. Ever wonder why you continue to feel stuck or frustrated even though you are trying? Do you sometimes feel there’s has to be a “secret” to manifestation you just haven’t found yet? Do you struggle with a stubborn chronic condition, addiction, or repeated relationship issues? Or perhaps you are simply curious about energy. Many of our patterned or persistent difficulties can be traced back to an unbalanced flow of energy through the chakras. The word “chakra” means wheel. 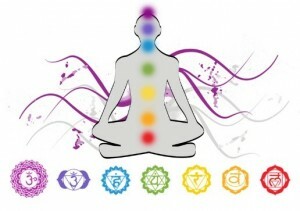 In the human body, there are 7 main chakras, or wheels of energy that are like data centers. From birth to the present, our energy centers continue to download data from the social environment, family, relationships, attitudes, beliefs, and every experience of how we each are positioned in the world, our world. It follows then that we tend to act upon what is programmed into us, healthy or unhealthy as it may be. The chakras respond to long term programming but they also respond to daily input. Sometimes we feel we have it together, sometimes not so much. Say, if you have deep issues of unworthiness stemming from childhood your whole energy system uses that feeling as a cue on how to act/feel today based upon what you learned/felt at 3 yrs. old. You can see that many of our behaviors/feelings lay in the subconscious energy and the sharing of that energy information is part of the function of the chakra system. Throughout my many years working with the chakras, I have used this system as a reference point in my own self development and also in assisting my clients in gaining an understanding of what they are made of, energetically, emotionally and physically. What I have found is that we are a sum total of all that we have experienced, even if that experience was formed before we had a choice or any perceived authority over ourselves. If you are 3 years old, you don’t have the tools to say “well, that’s not true”, therefore we download other peoples truths. This holds true for traumas, small and large. They shape what we think of the world and ourselves. Like a computer program, we sometimes need to rewrite the data base and clean up any non-beneficial viruses of thought or belief imbedded there. I know a balanced chakra system is an invaluable asset. Because the individual chakras each need and depend on the healthy working of the whole, a flow of unimpeded energy through the system promotes awareness and repair. No doubt a chakra balance is a positive action for everyone. It has immediate results and empowers a cascading effect through the body, mind and spirit. Everyone feels better after an energetic clearing and balancing. Yet, in order to facilitate consistent forward development, a person is well served to learn more about the symbolic and developmental aspects of the chakras so they can apply this knowledge to achieve a greater level of self-healing. As the chakra is repaired through self-awareness, the flow of communicative energy is more powerful and long lasting.